"First things first... It's no TouchFLO 3D. Ok, now that we have that out of the way we do have to say that we're happy to see another company making an effort to tidy up the Windows Mobile UI a tad. Who knows how far away we really are from Windows Mobile 7 becoming a reality and in the meantime, even many Windows Mobile die hards seem to be losing patience with the very dated look of the OS. Samsung, HTC and Sony Ericsson aren't the only companies attempting to bandage their mobile OS of choice however, as i-mate has just announced its "i-mate Go" UI. No, it's not the catchiest name in the game, but those of you looking for high visibility and simple design for your i-mate UI should be pleased. 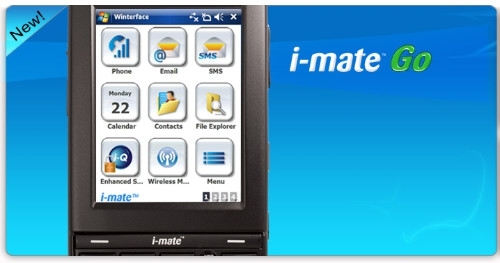 i-mate Go is powered by VITO Winterface of course, a Windows Mobile UI enhancement that essentially started as an iPhone rip off and evolved into a slightly less obvious iPhone rip off." Well, it isn't at all unexpected to see an alternate UI for Windows Mobile these days, which in itself is a bit sad. However, looking on the bright side, I suppose this truly signifies that i-mate is not dead, after struggling with the loss of HTC provided handsets. Still, I'd rather have one nice UI, rather than a patchwork of "improved" UIs floating around.